Salman Rushdie is the author of thirteen novels: Grimus, Midnight's Children (which was awarded the Booker Prize in 1981), Shame, The Satanic Verses, Haroun and the Sea of Stories, The Moor's Last Sigh, The Ground Beneath Her Feet, Fury, Shalimar the Clown, The Enchantress of Florence, Luka and the Fire of Life, Two Years Eight Months and Twenty-Eight Nights, and The Golden House. 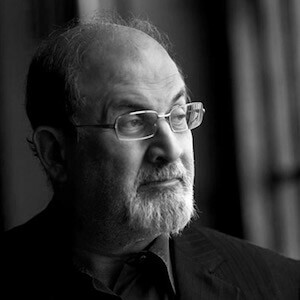 A Fellow of the British Royal Society of Literature, Salman Rushdie has received, among other honours, including the Whitbread Prize for Best Novel, the Writers' Guild Award, the European Union's Aristeion Prize for Literature, Author of the Year Prizes in both Britain and Germany, the French Prix du Meilleur Livre Étranger, the Crossword Book Award in India, the London International Writers’ Award, the James Joyce award of University College Dublin, and a U.S. National Arts Award. Read his complete bio on his website.